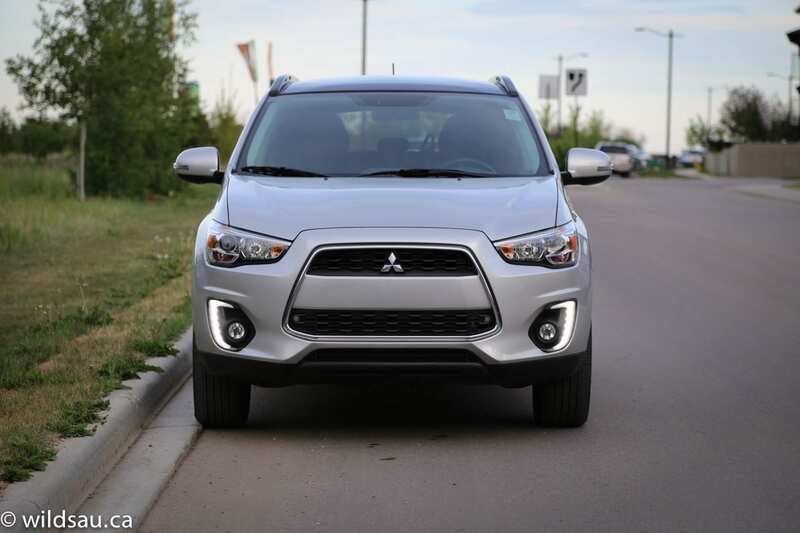 Mitsubishi’s little crossover surprises me with a cool 4WD system. Click on any picture to see a larger version. 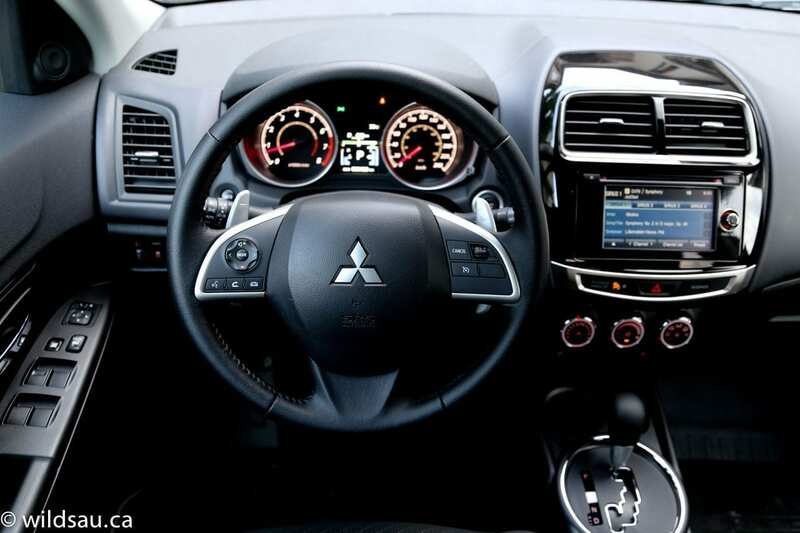 When I met with Mitsubishi before taking the RVR for review, they made it clear that they choose to compete only in vehicle categories or segments that they feel are sustainable. Well, the compact crossover isn’t just a sustainable category – it’s one that is growing fast. And the RVR is kind of an old-timer here. No, it’s not a pregenitor of the class like the original Honda CR-V and Toyota RAV4 but it definitely has some history under its belt now, having been with us since 2010. 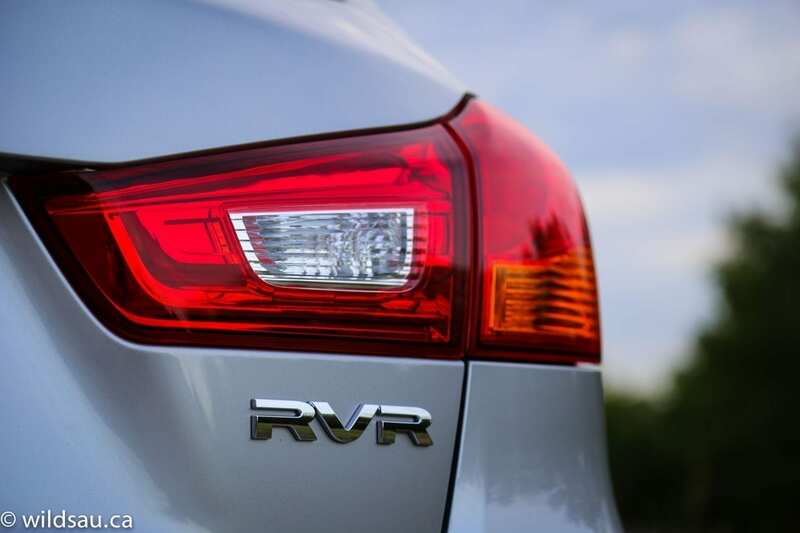 Is the RVR a big deal? 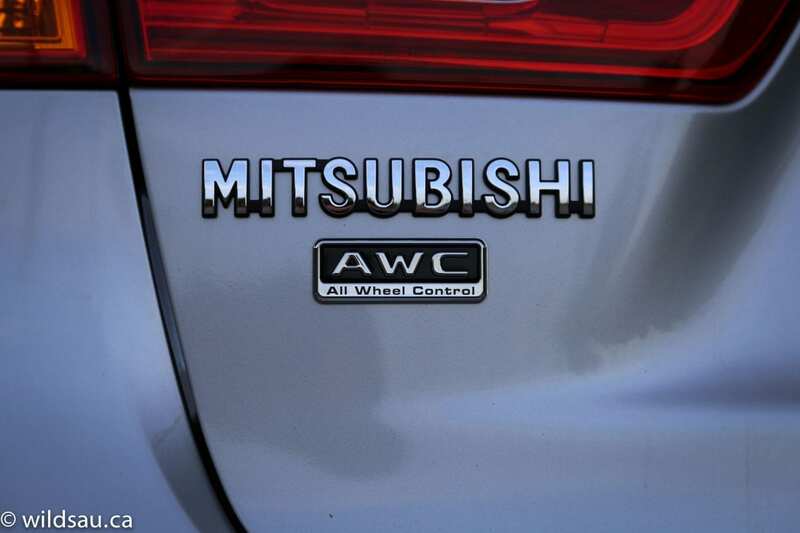 It sure is to Mitsubishi. It and the Lancer continue to swap spots as their best-selling vehicle. The RVR’s severe proportions, especially its short overhangs, were very striking when I first saw it a number of years ago. I’m used to it now, but it still stands out, and I don’t mind the styling. 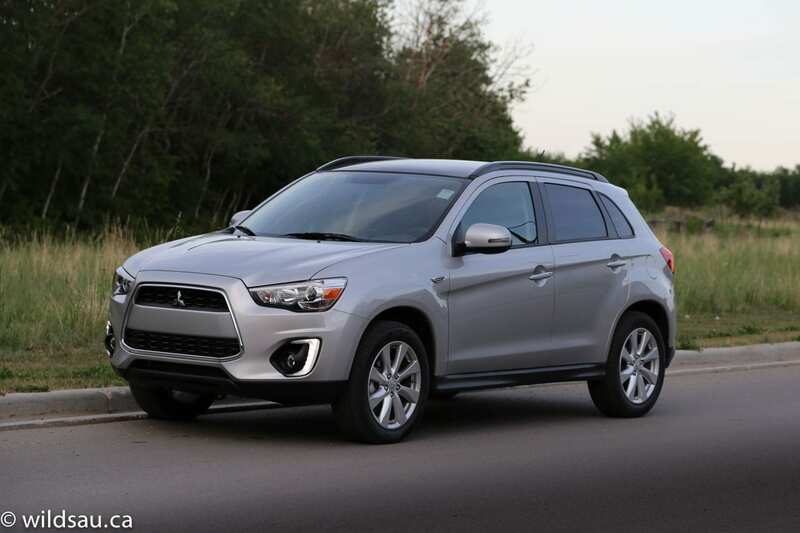 Kudos to Mitsubishi for at least doing something somewhat different. The overall shape hasn’t changed for this mild refresh, but some of the details have. 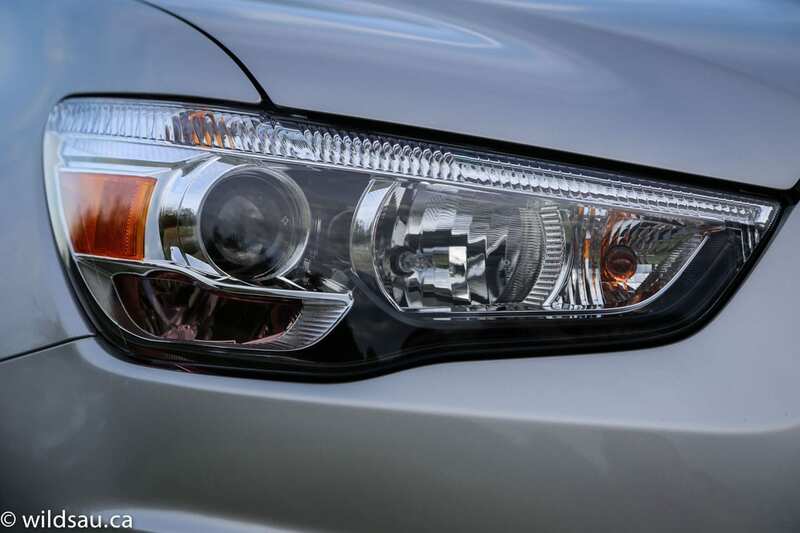 This up-trim GT has automatic HID headlights, as well as LED daytime running lamps and tail lights. And the whole package rolls on big-ish 225/55s and 18-inch alloy rims. 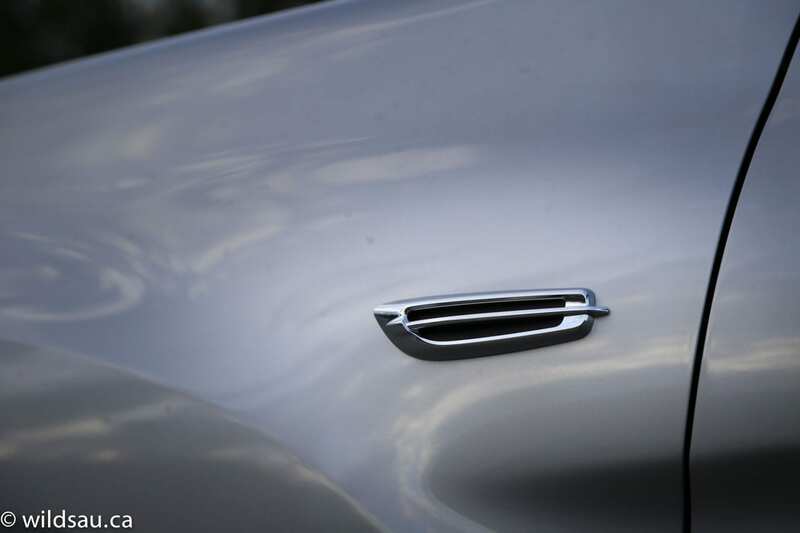 I like the corporate grille – its distinctive and slightly aggressive look works well. Sadly, Mitsubishi saw fit to give the RVR a Ford Escape-esque faux side vent. Ugh. One thing that’s not visible is that the front quarter panels are made out of polymer. Remember the Saturns? Where you could lean against them and bend them and they’d merrily pop back into shape? The RVR’s front quarter panels do that. Apparently it saves a lot of weight, and doesn’t impact the vehicle’s crash protection – the RVR gets the IIHS’ highest safety rating. Here’s the real big news. There were endless complaints about the RVR’s lack of power. The old 2.0 just didn’t cut it with North Americans who are eternally seeking a more powerful alternative, it seems. So the RVR got the new MIVEC 2.4-litre 4-cylinder. 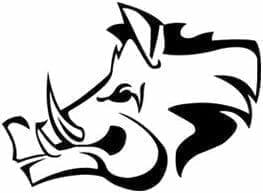 It bumps up the horsepower by 20 to 168 (at 6000 RPM) and torque to 167 lb.ft at 4100 RPM. 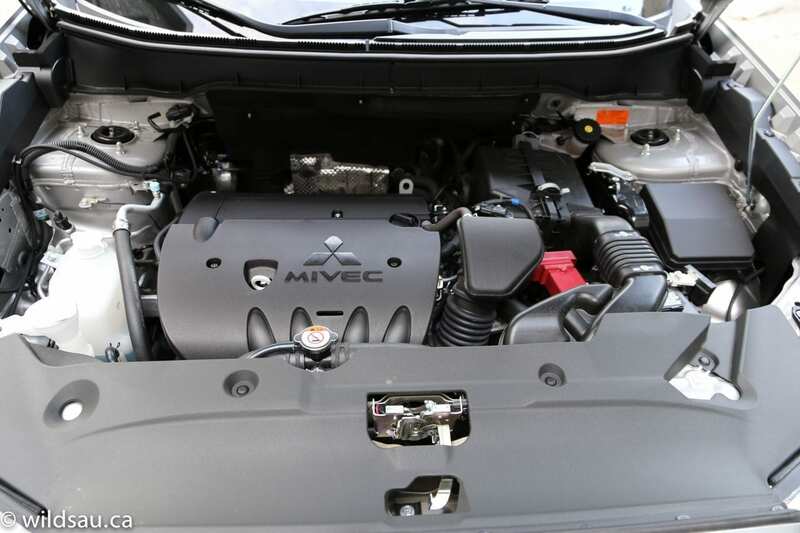 The continuously-variable transmission is also new and in the higher trims, the powertrain is coupled to Mitsubishi’s 4WD system. 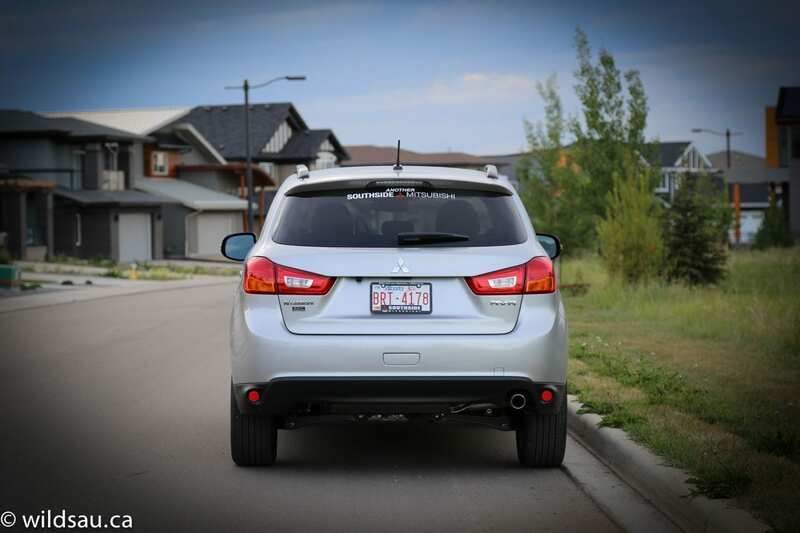 Fuel economy is reasonable, rated at 10.4 L/100 km (23 US mpg) in the city and 8.9 L/100 km (26 US mpg) on the highway. I appreciate the sizable 60 litre tank, which makes for a good highway range in the RVR. 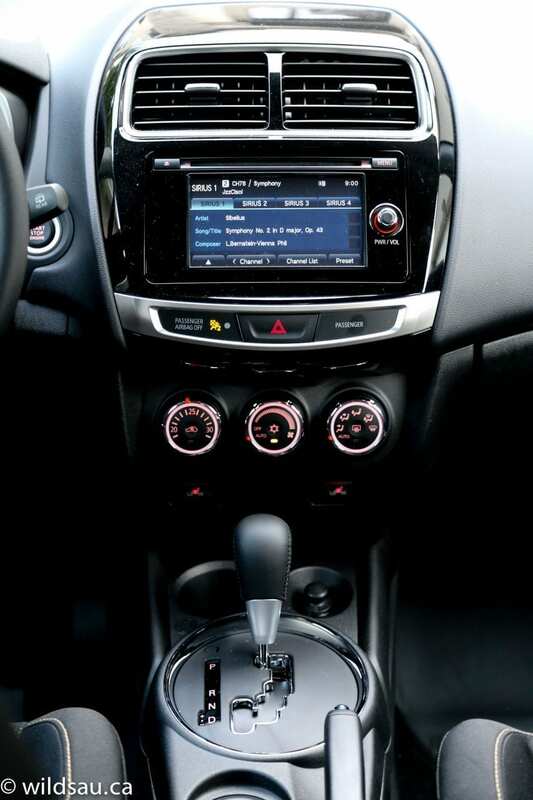 You won’t find the most modern or beautiful interior in the RVR. It’s very basic feeling and very black, and there are prettier spaces in this class. 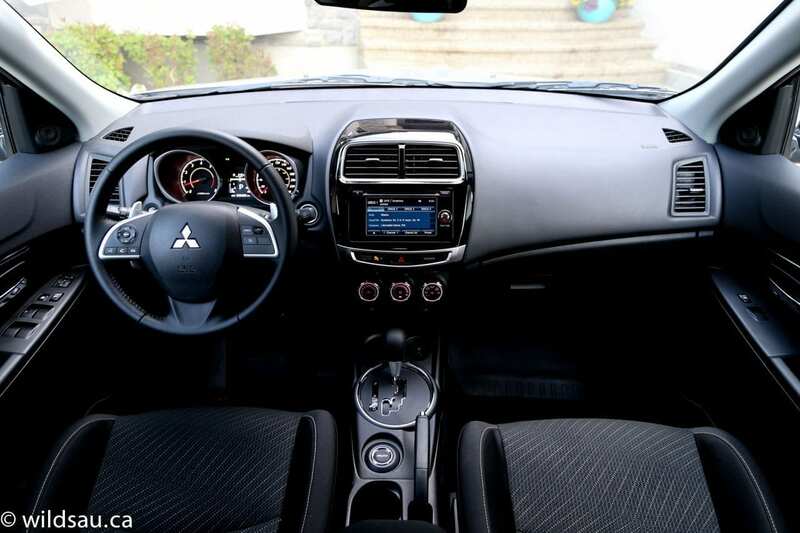 Mitsubishi uses some soft-touch plastics, and the fit of panels is decent, but the finish isn’t amazing – there are sharper edges on the bottom or back of some of the plastic parts, etc. I found the heated fabric seats comfortable. 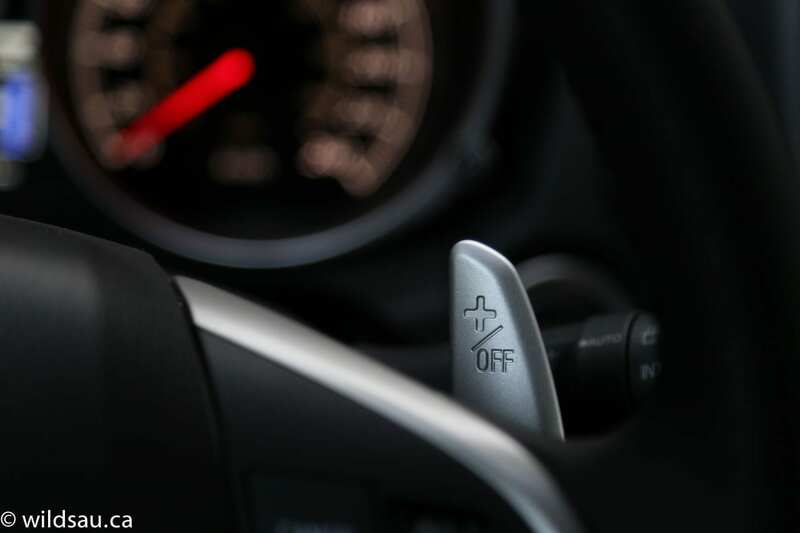 The seat heaters are controlled by a physical switch, which means that they’ll stay on until you turn them off – that’s the way they should be! The automatic climate control that uses three rotary dials and works very well. Audio and phone functions are managed with a touch-screen, as is the rear-view camera. I didn’t find the base sound system in my review vehicle to be very impressive. A couple of nice touches – the push-start ignition and the huge panoramic sunroof. It doesn’t open but has a powered sunshade. 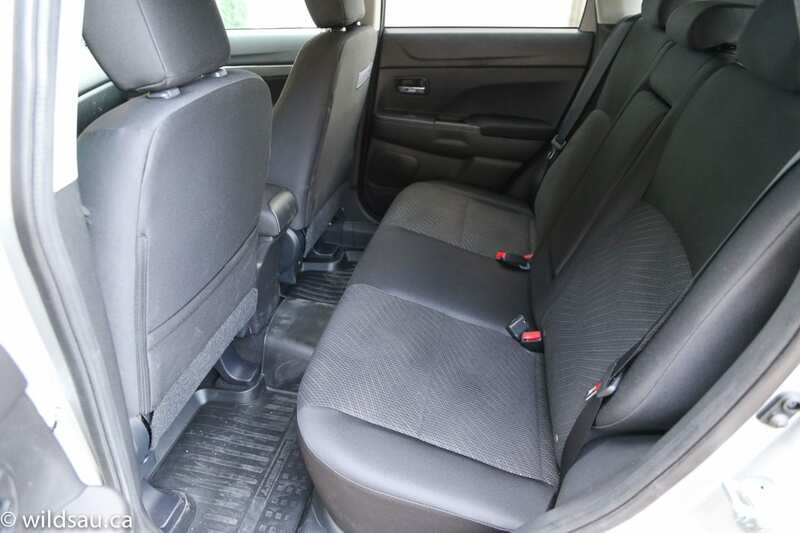 Once you’re in the back, the head room is OK (enough for me at 5’10”) and leg room is good with plenty of space for feet under the front seats as well. The seats aren’t fantastic but they’ll do, and the middle position is tight for adults as you’d expect in this category. 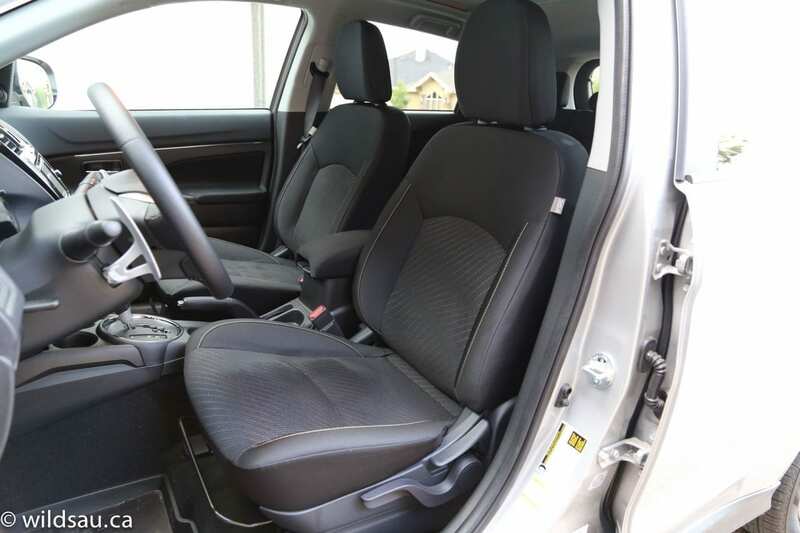 You get a middle armrest with cupholders and two sets of LATCH anchors for childrens’ seats. Our three kids fit back there well. The RVR has three cupholders in the centre console, including a can-sized one near the front and a dual-level bin in the armrest (with USB and 12V plugs). I like that the armrest lid slides forward and back to adjust for your comfort. 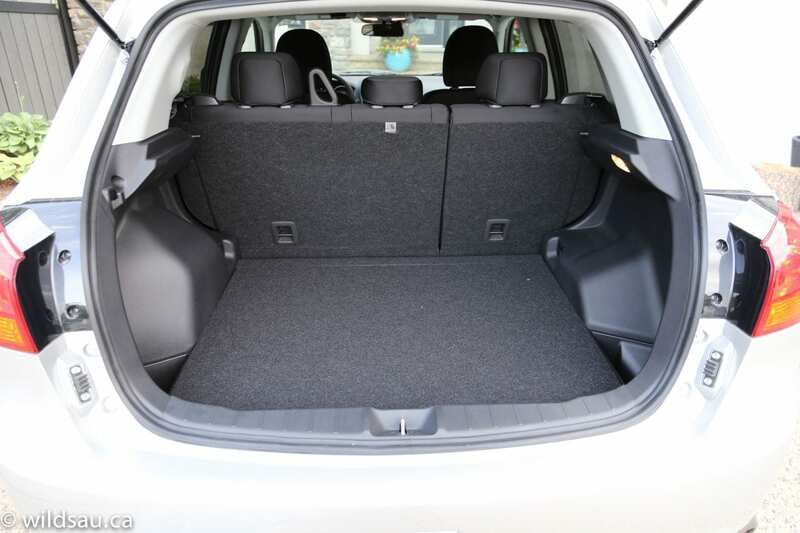 If you’re looking to move a lot of stuff, you’ll be happy with the spacious 614 litre trunk, as well as the ability to fold the rear seats nearly flat (they split 60/40) to increase that space to 1382 litres. Considering this RVR has the exciting new, more-powerful engine in it, I can’t imagine what the smaller 2.0 feels like, because this one still feels pretty gutless in normal driving. You’ll be in for a heart-pounding few seconds if you’re pulling into traffic as it can take a while to build momentum. A way to overcome that to a certain extent at least is to put the RVR in manual-shifting mode and to start the CVT in “first” gear. This lowest ratio gives it a bit more gusto off the line, but a person really shouldn’t have to use a manual shifting mode to exercise that option. I’d prefer a Sport mode instead. Anyway, for normal driving situations, it has enough power and for those where you’ll need the extra oomph, you can just plan ahead or wait a little longer. By the way, the manual “shifting” is crisp and quick and the faux gear ratios are quite convincing. The large, stationary paddle shifters behind the steering wheel are a pleasure to use – and wouldn’t feel out of place in a pure sports car. I did find a bit of lurching from the CVT, especially at lower speeds, and I wouldn’t consider this the most refined transmission out there. I found the ride to be quite smooth and it soaks up all the bigger hits, although the suspension gets a bit noisy over road imperfections. The vehicle’s overall small size makes it somewhat fun to drive, and I liked that part. Steering is reasonably quick, and the relatively light 3285 lb (1490 kg) RVR handles well for its height. The height is definitely noticeable though and there is a surprising amount of body lean. Thank you for putting a decent dead pedal in the RVR, Mitsu! 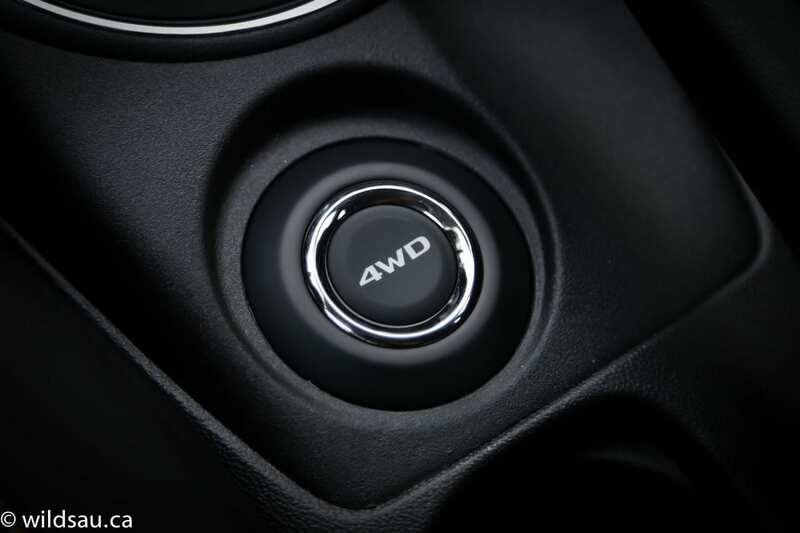 Something cool – the RVR’s selectable drive mode that allows you to choose between 2WD, automatic 4WD and 4WD Lock. I like that, and the option to do this really sets Mitsubishis apart from the competition. No need for all-wheel drive for most driving on dry surfaces, and the ability to turn on additional traction when you do need it in rain, snow or icy conditions. Sweet! 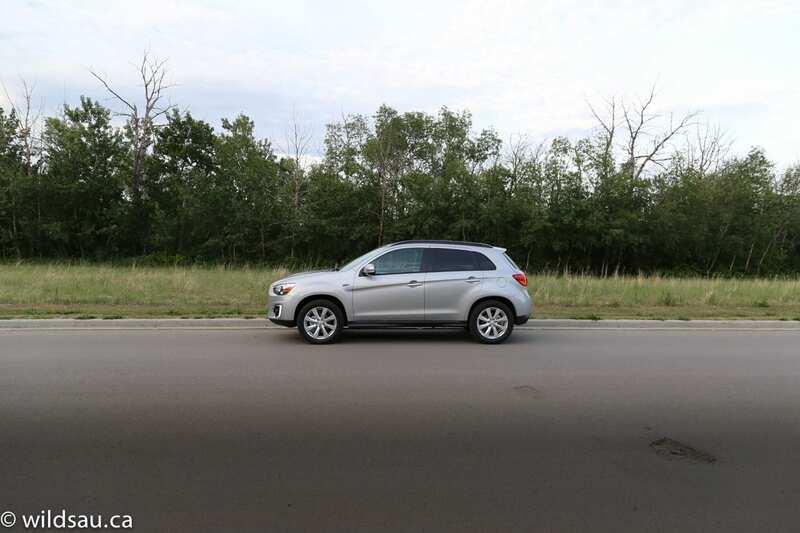 The overall noise levels are acceptable – road noise was reasonable around town, but really got noticeable (and irritating) at highway speeds – so did wind noise. I like that the engine has a nice 4-cylinder snarl. 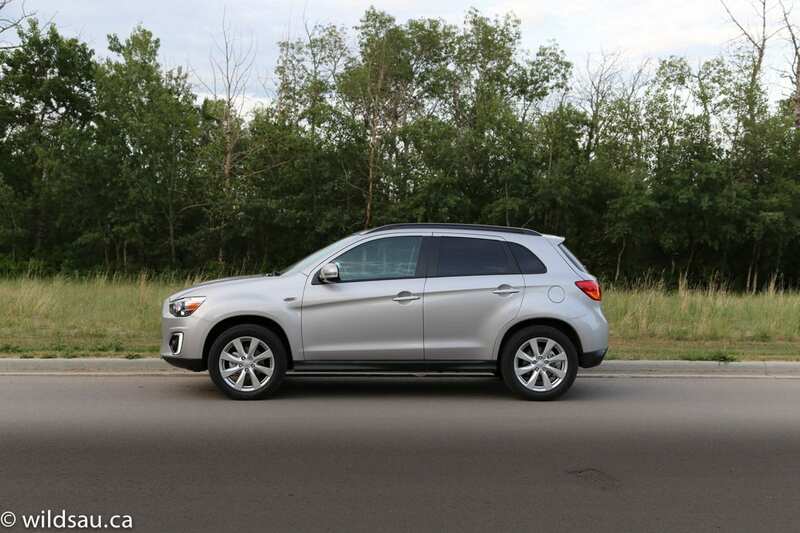 At first blush the RVR feels basic. But once you start looking around and driving it, you’ll appreciate that it is quite well equipped. Those wanting to can add leather seats, navigation and an upgraded sound system. I liked the ride and found it to have a well-balanced suspension set-up. The drivetrain isn’t the most refined but is perfectly acceptable to me. 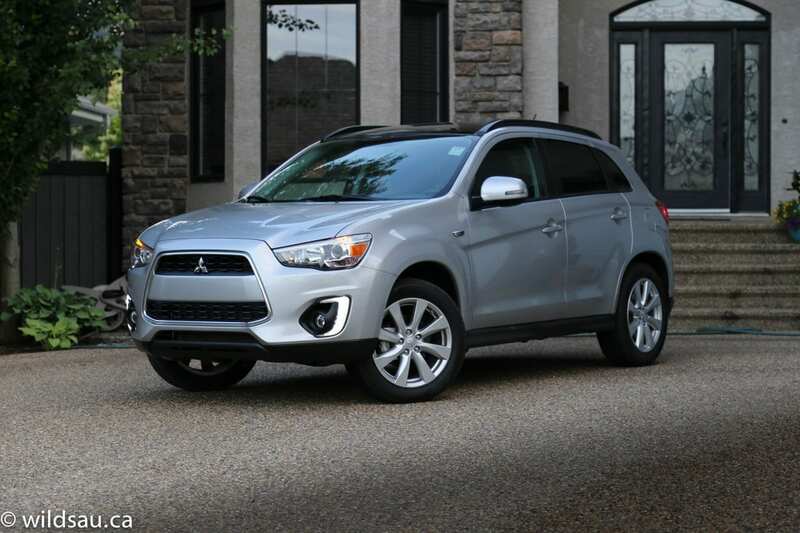 Mitsubishi also sets itself apart with its stellar 5 year/100,000 comprehensive new vehicle warranty and 10 year/160,000 powertrain – it’s pretty hard to argue with that, and Mitsubishi makes it clear that they wouldn’t offer a warranty like this if they weren’t confident in the quality of their products. WAF (Wife Acceptance Factor) was quite high. She really liked the exterior styling, calling it cute, and she also liked how easy it was to drive. The RVR does things differently, and it is a unique little thing. It’s certainly not to everyone’s taste, but a number of RVR owners I talked to said they drove a number of competitors and they absolutely bought their RVRs based on preference. It definitely resonates with a certain group of consumers and in the lower trim levels, it is an outstanding value too. 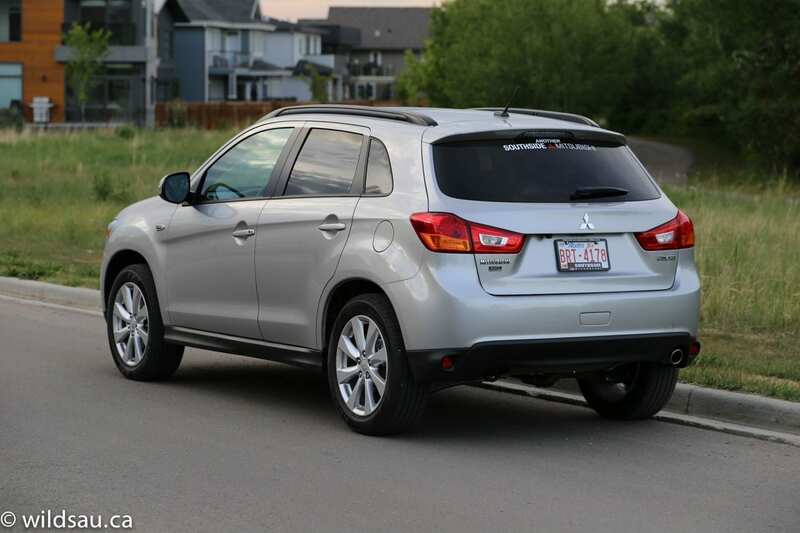 Disclosure: Vehicle was provided by Mitsubishi Canada.